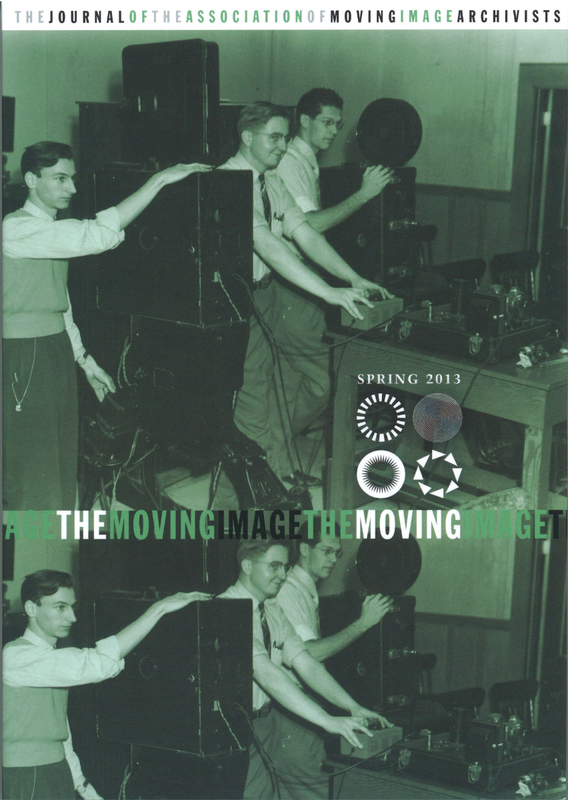 Cover of The Moving Image, The Journal of the Association of Moving Image Archivists (AMIA), 2013. Going through the files of Marion Michelle, kept by the European Foundation Joris Ivens in Nijmegen, is like reading a crime novel. Sabine Lenk, who researched these files: ‘her papers document important moments from a quintessential conflict inside the Fédération Internationale des Archives du Film (FIAF, International Federation of Film Archives). Some of the best known film archivists such as Henri Langlois, Ernest Lindgren and Jacques Ledoux, played a significant part, as well as FIAF-president Jerzy Toeplitz. The latest issue of the ‘The Moving Image’ [ISSN 1532-3978] published her article ’Then began the battle royal”, written in collaboration with André Stufkens. In this article the conflict is reconstructed from the point of view of Marion Michelle. Being the secretary of FIAF she functioned as a catalyst of this conflict, accelerating a development inside FIAF necessary to force a club of old friends to reform and become a professionally structured and ever growing association of film archives. Since 2002 the European Foundation is associate of FIAF. Marion Michelle, who fell in love with Joris Ivens the moment they met in January 1944, gave her collection to the Foundation, because of her shared live with Joris Ivens. She joined him in Australia, where she was asked to film the strike in the harbor of Sydney for Indonesia Calling! This story of the Battle Royal is full of distrust and deception, betrayal and falseness; but it also reveals growing friendship among people trying to sort out an extremely difficult situation, which -- as “loyal servants” to their cause -- forced them to “murder” one of “FIAF`s fathers,” Henri Langlois so, that the association could become independent. Sabine Lenk (1959) is a film archivist, and Affiliated Researcher at Utrecht University. She worked for film archives in Belgium, France, Luxembourg, and the Netherlands. From 1999-2007, she was the director of the Filmmuseum Düsseldorf (Germany). She is a co-founder of KINtop, Jahrbuch zur Erforschung des frühen Film. She has published widely on film archiving, cinema museology and early cinema in journals such as Film History, Montage/AV, 1895, Journal of Film Preservation and Archives. Her most recent book is Vom Tanzsaal zum Filmtheater. Eine Kinogeschichte Düsseldorfs (2009).